Accommodation in Stellenbosch: Andria’s Self Catering Guest Flat. 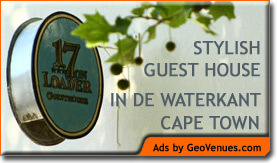 You are here: Home / South Africa / Accommodation in Stellenbosch: Andria’s Self Catering Guest Flat. This is a delightful one-bedroomed apartment with private garden and lock-up garage. All amenities available for a comfortable stay. Lovely big sparking pool. Children welcome – baby cot available. Meals on request. Private barbeque area. Travel information available.